Cut and connect two braces. 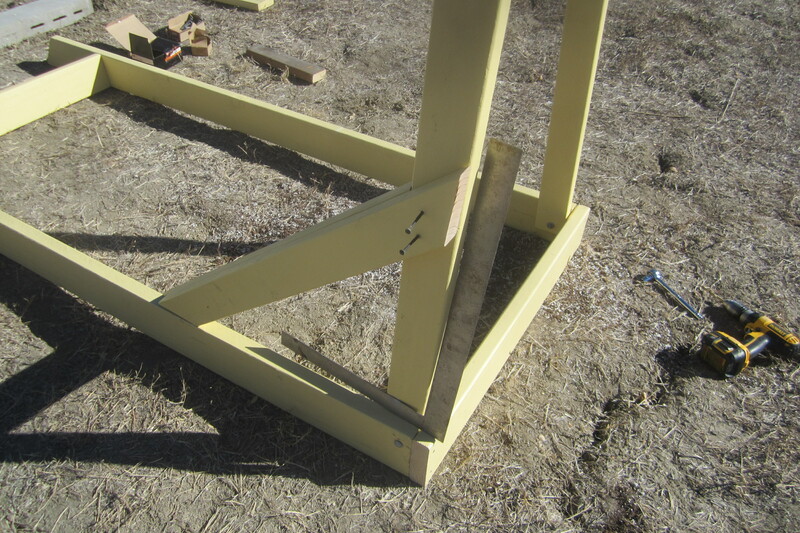 Each brace consists of two 2×4 pieces offset and screwed together. The ends of each component 2×4 has 45 degree angles cut. The two components of the brace will likely have different lengths. 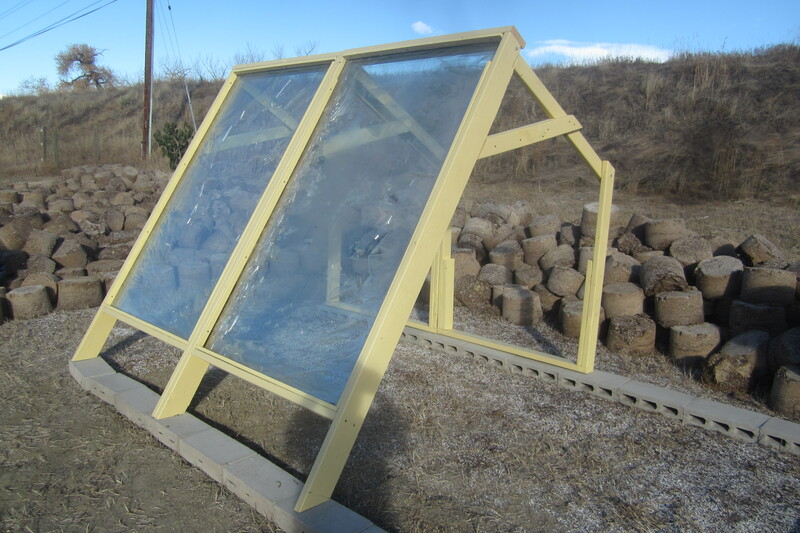 Examining the partially completed greenhouse (below) one can see where the brace will eventually end up. The two 2×4 components of the brace are found in cells (H11 and I11) and (H12 and I12). There is a longer side to each component, and the shorter side results from cutting 45 degree angles. Using a miter saw to make the cuts would be fine; the measurements are for if one has to lay out the cut with a tape measure. Connecting the two components to make the brace. Each brace will be for a specific side of the bay. In each case, the longer of the two components will be on the outside and the shorter on the inside. The longer component should extend beyond shorter to accommodate covering a 2×4 in the back. Examine the photo on the upper right – the brace will line up with the roof joist. Screw the two components together so this is possible. Note that the overlap at the front of the brace will be less. This will allow room for the pane of glass. Refer to the photo at the upper right. 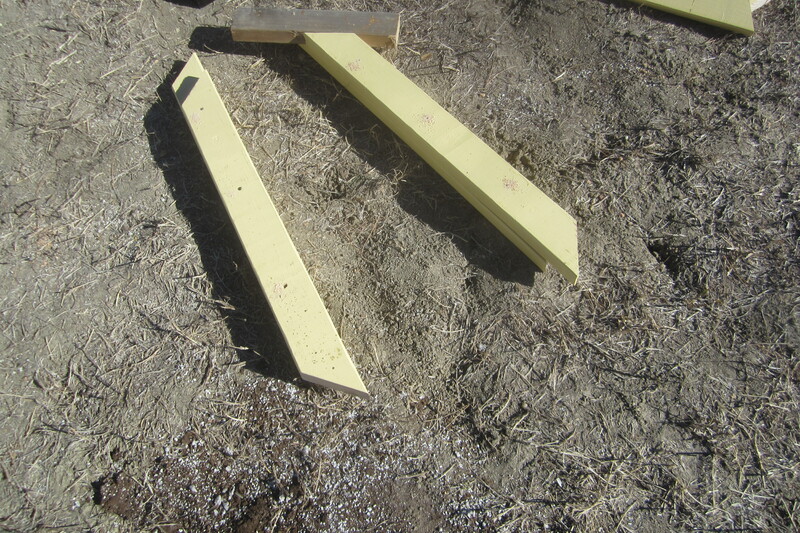 Use a square to move each roof joist so it is perpendicular to the frame. Then lay the brace between the frame and the joist and screw it into place.